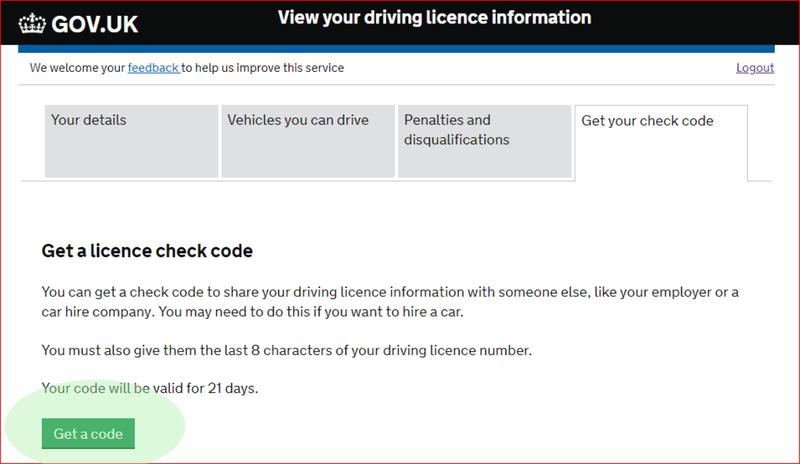 There are now Two ways to obtain your licence check code, you can add a licence check code to your mobile phone HERE or follow the instructions below to email/print a copy of a licence check code. Once you have entered the details click "View now" and you will be taken to a page which has 4 tabs, you will need to click the “Get your check code” tab. ” button on it, click this button and a code will be generated. When you have your code you can write down the Case Sensitive code and bring it with you or to save time at the check-in desk you can click "Print or save a driving summary" this will open or download a pdf document which you can send to our reservations team at reservations@intack.co.uk if sending the document please quote your booking reference number so we can identify your booking. The code generated is only useable Once and lasts for 21 days so if your booking is not within the next Three weeks please wait until nearer the time to generate and send your code. If you are having problems obtaining a code using the website you can call DVLA on 0300 083 0013 and an operator will generate the Case Sensitive code for you to write down and bring with you.